Besides specializing in Feng Shui Products, Feng Shui Bestbuy is the wholesaler and retailer of many types of Buddhist and Taoist statues/figurines, joss stick, religious accessories and prayer items for the altar in homes and temples. As God of War, he stands against evil and is the ultimate symbol for justice, honesty and integrity. 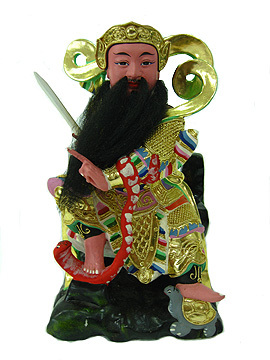 Standing with his famous "kwan dao" held on his right, he is portrayed with good-sized moustache and beard, and fierce slant eyes is a sign of his bravery. His fierce counternance brings with him powerful energy. His majestic exuberance in this special stance exerts his benevolence to bring wealth and authority. Regarded as the God of Wealth, he is, amongst many other titles, the protector of the financially oppressed and protector of wealth. Place his statue in the living rooms of the home facing outwards watching your main doors as a symbol of protection against evil, robbers and harmful people. In business, Kwan Kung protects the entity from fraud and embezzlement, promotes employee loyalty and ensures smooth sailing. It is believed that leaders and businessmen who place the Kwan Kung behind them at work will never lack for powerful support from powerful figures. This is believed to help business prosper even against overwhelming odds. Kwan Ti (later known as Kwan Kung) is the most famous war general in the history of China. He is perceived as China's finest military heroes, and was elevated to the rank of God of War in 1594, becoming one of the most popular deities in China. 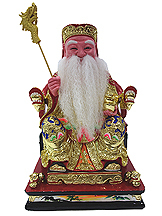 His image could be found universally at home, office or business premises of Feng Shui enthusiast, as he was invoked to aid those in need of assistance. Kwan Kung is simultaneously deified as the God of War as well as the God of Wealth. Kwan Kung is the embodiment of power, strength, integrity, and honor. Kwan Kung not only bestows a strong force of protection, his presence brings about status, fortune and confidence. Kwan Kung is feared by all evil and revered by all who are sincere at heart. No evil may lurk in the presence of the God of War. Kwan Kung protects the righteous and defends the innocent. La Cha being the third prince of Lei Cheng (deity holding a pagoda) was born with special powerful fighting skills at a tender age and was made a warrior at the age of 7. His strong presence among the chinese community is due to his popular epic. His most popular weapon is his magic rings he use to fly on sky and fight his opponents away. He always take the lead on any war against evil, with his entourage sent down by heaven. His presence will scare off all evill spirits on earth. Invite this La Cha into your prayer hall for protection! 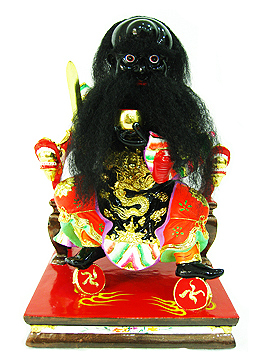 Tua Peh Kong is another extremely popular God of Wealth especially in Southeast Asia (Singapore and its nearby countries). Most of the Buddhist and Taoist temples, homes and businesses in southeast Asia have his figure popularly worshipped by devotees. His presence signifies windfall luck, gambling luck, business luck, authority/high ranks, prosperity, excellent fortune and longevity. Some great politicians seek his advices to economy forecasts of districts or states. Most housewives would throng his temples for blessings before purchasing lotteries. 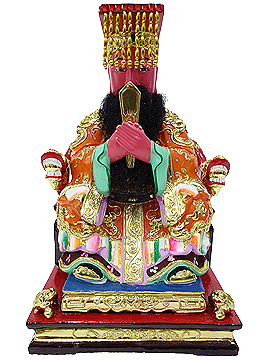 This traditional styled statue of Xuan Wu Deity mimics the authentic ones you find at prayer altars of ancient chinese temples across Southeast Asia and Hong Kong. The stunning statue is hand-painted and gold leafed in great details. Lord Xuan Wu (also called The Dark Lord of the North or The Lord of True Martiality) is one of the most widely revered Chinese deities, ranking in popularity behind only Guan Yin and Kwan Kung. 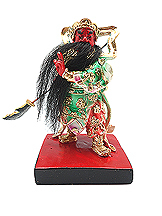 The deity is always depicted holding a magical sword, which he borrowed from one of the 8-Immortals named Lu Dong-Pin. Legend says that he borrowed the magical sword to beat off a powerful devil, and after he was successful, he refused to return the sword back to Lu Dong-Pin. If his palm opens, then his sword will automatically fly back to Lu Dong-Pin. Therefore he always hold this sword tightly, not wanting to let it go. Lord Xuan Wu is also always depicted with a tortoise and a snake, beneath his feet. He is revered as a powerful God, able to control the elements (worshipped by those wishing to avoid fires), and capable of great magic. He is particularly revered by martial artists, and is the 'patron saint' of Wudang Mountain in China's Hubei Province, where he attained immortality. 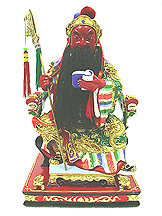 Lord Xuan Wu (also called The Dark Lord of the North or The Lord of True Martiality) is one of the most widely revered Chinese deities, ranking in popularity behind only Guan Yin and Kwan Kung. 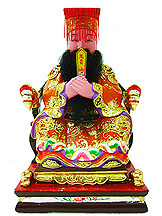 The God is always depicted holding a magical sword, which he borrowed from one of the 8-Immortals named Lu Dong-Pin. Legend says that He borrowed the magical sword to beat off a powerful devil, and after he was successful, he refused to return the sword back to Lu Dong-Pin. If his palm opens, then his sword will automatically fly back to Lu Dong-Pin. Therefore he always hold this sword tightly. 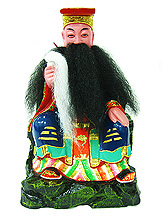 Lord Xuan Wu is also always depicted with a tortoise and a snake, beneath his feet. He is revered as a powerful God, able to control the elements (worshipped by those wishing to avoid fires), and capable of great magic. He is particularly revered by martial artists, and is the 'patron saint' of Wudang Mountain in China's Hubei Province, where he allegedly attained immortality. Fa Zhu Gong was born during the Song Dynasty in the Hokkien Province of China. Legends said that Fa Zhu Gong had 2 sworn brothers (name as Xiao Gong Sheng Jun and Hong Gong Sheng Jun). Due to the battle with a thousand-year-old snake demon, he sacrificed himself. After the heaven knew about his braveness, he was being appointed as a deity that held an important role in the Celestial Court. And according to Taoist records, he was known as the disciple of Xu Zhen Ren aka Gan Tian Da Di which later being addressed as Lv Shan Fa Zhu Zhang Sheng Jun (Lv Shan is the Sect that Zhang Gong belongs to). The Jade Emperor (Yù Huáng or Yù Dì) in Chinese folk culture, is the ruler of Heaven and all realms of existence below including that of man and hell, according to Taoist mythology. In actual Taoism, the Jade Emperor governs all of the mortals' realm and below, but ranks below the Three Pure Ones. He devotes his time helping the needy (the poor and suffering, the deserted and single, the hungry and disabled). Furthermore, he shows respect and benevolence to both men and creatures. The Jade Emperor's Birthday is said to be the ninth day of the first lunar month. On this day Taoist temples hold a Jade Emperor ritual at which priests and laymen prostrate themselves, burn incense, and make food offerings. Chinese New Year's Eve is also a day of worship as it is said to be the day the Jade Emperor makes his annual inspection of the deeds of mortals and rewards or punishes them accordingly. On this day incense is burned in the home and offerings are made to the Jade Emperor and also to Zao Jun, the god of kitchen who reports to the Emperor on each family. Lu Dong Pin is an immortal and a legendary being of Taoist sect, said to have lived at various times and attained immortality through his studies of Taoist magic. 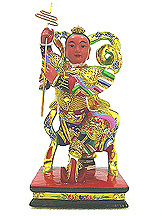 He periodically reappears on earth to help bless families with positive energy, cure diseases, ward off evil, bring good fortune and prevent disasters. His appearance in homes that have excessive negative energy ensures that the place is evil free because he possesses powerful magic to subdue evil. Providing protection against evil energy instantly is his strength.